As the experts in heat networks, Insite does the hard work for you. We ensure that residents are treated fairly and charged accurately for their heating and hot water use, and that their queries are answered in a timely, thorough and knowledgeable manner. Because we’re not an energy supplier, we can focus on providing metering and billing services that are convenient and reliable for landlords, housing associations and residents’ associations, and fair and flexible for residents. Our team of in-house specialists can take the lead by managing everything from tariff composition to communicating with residents. Our aim is to protect you from the risks of operating heat network systems, be they reputational in dealings with residents, or financial in charging residents for their energy use. For many landlords, housing associations and residents’ associations, especially those with past experience of operating heat network systems, debt risk management is a key concern. Insite has a specialised resident service team to deal with debt management and has the systems and processes in place to effectively and fairly manage and report on resident debt issues. When the issue of resident debt must be avoided altogether, installing a pay-as-you-go system such as our Guru Hub system can be the answer. The simplest method of metering that Insite offers, credit billing uses meter readings to issue residents with a bill that covers their heating and hot water use for the relevant month. Bills can be sent through the post or by email. Residents pay for their heating and hot water use monthly in arrears. Thanks to our smart metering technology, we don’t need to physically enter residents’ homes to read their meters. Instead, automated meter readings are sent straight to us, improving convenience and accuracy. Concerns over residential customer debt are at the forefront of planning for many new projects involving a communal heating system. One way to minimise debt risk is to implement a pay-as-you-go metering system within the project design. At Insite we can advise you on which of the many PAYG metering systems you should invest in for new build projects, such as the award-winning Guru Hub. If you’ve got an open protocol system that was installed by a competing service supplier, we can adopt it and combine it with our exceptional residential customer service experience and wide range of complementary services. Insite’s Flexi-Pay is a bespoke payments platform produced in association with a leading-edge payment technology partner. It offers residents the choice to conveniently and securely pay for their heat online; over the phone; by SMS text; in person over the counter at any of 24,000 UK Paypoint locations, or through our unique auto-top up solution that enables residents to select their payment preferences in advance and then let the system manage itself thereafter 24/7 all year round. Flexi-Pay payments are verified instantly, credited directly to the resident without any delay, and the funds are securely deposited into our Clients trust bank account before being reconciled every month back to our clients. A dedicated, in-house call centre team is available to each building or project via a dedicated low- cost telephone number, which can track monthly call statistics. Callers are directed to the customer care team best equipped to assist them depending on the reason for their call, whether it’s paying a bill, providing a meter reading or discussing tariffs and charges. An automated call-back system is available for residential customers who do not want to wait during peak call periods. An emergency out-of-hours contact number is provided for residential customers experiencing metering-related heating or hot water problems outside of office hours. Residents can also get support directly from Insite’s online support pages. Trouble-shooting advice helps residents solve the most common issues, before directing them to the relevant telephone call centres. A residential customer support email address gives residents the flexibility to discuss less urgent issues at a time that’s convenient to them. Our dedicated client services team is there to provide ongoing expert support to landlords, housing and residents’ associations every step of the way. We also provide an on-site delivery team to ensure the metering and billing systems that fit your needs are installed and commissioned correctly. From project managers to qualified in-house electricians and plumbers, our capable team has the resources necessary to deliver the systems on time and solve any issues arising during installation and commissioning. The delivery team remains in close contact with you, the site and any relevant subcontractors until the installation has been signed off and is operating correctly. Our exclusive Auto-Pay solution for use alongside the Guru PAYG system offers residents the ability to set up a payment from their nominated credit or debit card that can trigger by; a low credit balance on their Guru system, a fixed amount on a set date and frequency, or a variable amount on a set date or frequency. Once set up, the resident can rest assured the system will look after itself, the ultimate in payment convenience. The Guru Flexi-Pay system’s key features include monitoring energy usage and expenditure, as well as reporting meter readings, which can be very helpful to answer resident queries related to consumption. 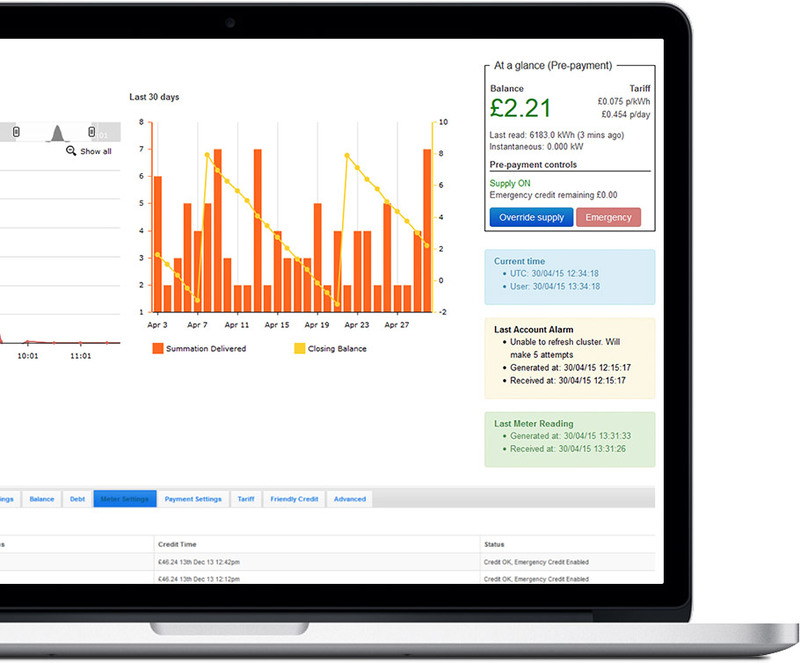 Management of balances, payments, debt and tariffs is streamlined through individual tabs. The dashboard also allows us to check the system status, activate emergency credit and switch the supply on or off. Advanced settings also enable us to troubleshoot issues remotely, cutting down on disturbance for the residents.